How many times have you heard the sound of an alarm siren in your neighborhood? Did you assume it was a real emergency or a false alarm? Alarm systems that repeatedly “cry wolf” may be ignored by neighbors. Worse yet, emergency responders may regard your alarm call as another false alarm from a troublesome system. Emergency responders may respond to your alarm call at high speed. The speedy response could create a hazard for the responder or for others. Response to real emergencies could be delayed. Every emergency dispatch to alarms has a cost that communities must pay for. The annual cost of responding to alarms is significant. For this reason, many cities Some cities collect fines from alarm owners for excessive false alarms. 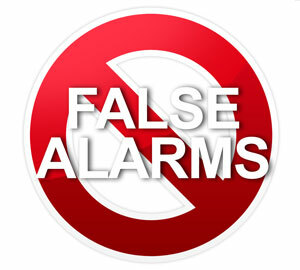 Check with your city to see if a false alarm ordinance applies to you. If a relative or friend has a key to your home, make sure they know how to operate the alarm. Giving them the code is not enough. Make sure they have the number of the monitoring office and know how to cancel an accidental alarm triggering. Have any problems fixed as quickly as possible. If a door or window is broken or an alarm sensor has been dislodged, have it repaired without delay. If your alarm has a problem, make sure to notify your alarm company. Make sure to notify your alarm service of any emergency contact phone number changes. If you get a new office phone number or cell number, give the new number to your alarm company or central station. Notify your alarm company about any major remodeling. Changes could affect wiring, devices or he coverage area for motion detectors. A call to your alarm company can save problems the next time you use your alarm. Make sure to have your system batteries replaced at recommended intervals. Your main system battery should be replaced every 2-3 years. If you have wireless door and window devices, check to see how often the batteries need to be replaced. Be aware of items that could block or change the coverage of your motion detector. If you have a new indoor pet the motion detector may need to be adjusted or replaced with a pet-resistant motion detector. Modern security systems have built-in technology designed to reduce the chance of false alarms. Follow these tips and your alarm system will be less likely to “cry wolf”!